Belly rubs would be mandatory. The universal anthem would be a chorus of ArRRoOos. 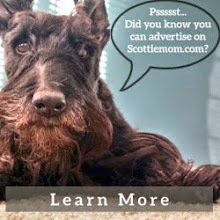 No one and nothing would be homeless - to a Scottie, everything is "mine." C-A-T-S would go in hiding. Political figures would be cuter and much more popular. The highest paid athletes would be soccer and agility Scotties. There would be no such thing as international trade - again, because everything is "mine." The Pinwheel Scotties and other such videos would dominate the evening news. Swimming pools wouldn't be so deep. Treats would be given freely and in abundance. Decisions would be made quickly - if you don't like it, pee on it and move on. Bed beard would officially be the cutest look ever. Winnie the Pooh (and every other stuffed animal) would no longer be stuffed with fluff. No sock or undergarment would be safe. There would be no such thing as "people food." It would simply be food. Crates would only be used to store toys and other treasures. Breakfast in bed would be served daily. Long walks on the beach wouldn't just be something you dream of. Zoomies would be worked into everyone's physical education. All beds, couches and other comfortable furniture would be easy to climb on. Shoes would be approved play toys. Everyone would experience Scottie Love at some point in life (and never look back!). excellent! my jacque and pippen are ready to join your army to take over the world!!! Winston disagrees with the 'lack of fluff' in Winnie the Pooh-no fluff, no mess. He NEEDS his fluff to spread around! and he would love it if everyone got out of HIS way when walking...no matter how much bigger they are-Scottie walking-make way! 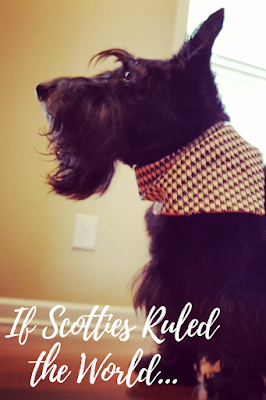 Why would obedience be optional with Scotties ruling? Because they're so stubborn and tend to take commands as suggestions for their consideration. 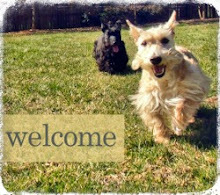 I am getting my Scottie girl, Clarabel, in less than 3 weeks. And your blog makes me sooooo excited. I have been like a real expectant Mom, readying her room etc. Thanks for all the helpful tips and discussions. Go Scotties - all power to you! You speak the truth, King K! Maggie adds that snow cones would be available all day and Wally says that Bacon would be the official health food of all dogs! AaaaaaaRooooooo! Love it! Scottie pinwheel...LOL who doesn't know what that is!! A side note to Crystal....so excited for your new arrival. Clarabel is a unique and darling name. Happy for you!